Inside: Ideas for fun things to do when you are by yourself. 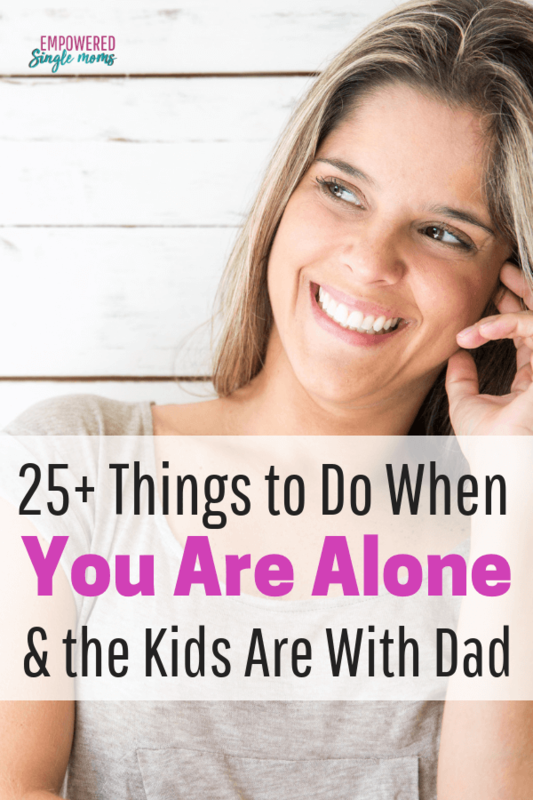 These ideas will help you answer the question What to do when you are alone and the kids are with their dad. Often one of the hardest times after you separate from your partner is the first night and then the first weekend your kids are with their dad. 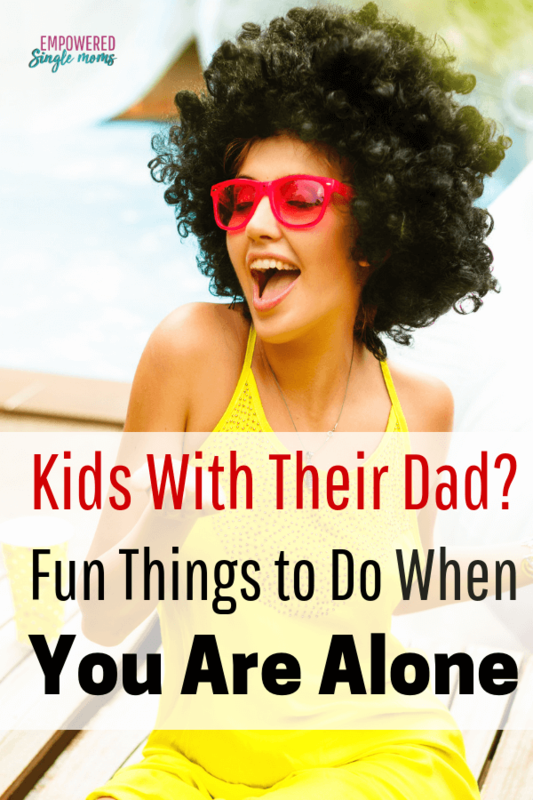 If you are like me the first few times you are home alone without your kids it feels like a piece of you is missing. You just don’t feel complete. Go ahead and have a good cry I did. Once you’ve had your cry you need to make a plan. came to cherish that time alone and so can you. Journaling is a great way to explore your feelings, clear negative beliefs, set goals and relieve stress. This journal with journalling prompts will help you identify your strengths, set goals and break those goals down into manageable steps. Make it a goal to put 100 things on your bucket list. It’s a fun exercise to stretch your mind into all the possibilities. When you aim for 100 you get beyond the mundane and are able to really dream. The Thriving at Life Challenge will help you get a positive attitude and turn your dreams into reachable goals. An inspiration board is a great way to have a visual representation of your goals. When you hang an inspiration board on your wall it keeps your goals at the forefront of your mind. This one makes history interesting. This one makes economics fun. I am listening to this one as I write because one of my son’s recommended it. I am not sure it is for me (a little too potty mouth), but it might be for you. That’s the great thing about podcasts you can try them out and if you don’t like them be gone with them. There is something therapeutic about making order out of the chaos of those 1000 piece puzzles. You can do the puzzle alone or get it started and let the kids help finish it when they are back home. Everyone has a story to tell. You could write a how-to book or start a novel. If a book seems too much start by writing a short story. Use some bath bombs, candles, and essential oils to make it a spa-like experience. Imagine the luxury of having the bathroom to yourself for 1/2 hour and no one will even be knocking at the door for your to referee a fight with their sibling. Playing a musical instrument is a great outlet for feelings and creativity. You could take lessons from a local teacher or start with some instructional YouTube videos. You can often buy used instruments for a song (no pun intended, but it works) at flea markets, thrift stores or garage sales. It is a great hobby. You can start one for less than $4.00 a month. Here are the directions on how to get started. Some people turn their blogs into an online business or use a blog to support their brick and mortar business, others blog as an outlet or to connect with like-minded people around the world. This blog has given me the opportunity to meet and work with some of the most interesting people I know. I have also been able to reach and help 1000’s of times the number of people I could have served if I was limited to the people who could actually get to my office in person. Imagine the luxury of having a long uninterrupted visit with a friend. When the kids are gone it is a great time to connect with people you don’t have time for during the busyness of after school to bedtime routine. When the kids are away and you are alone it is a great time to get some tasks done that take focus uninterrupted time. Do them when you are by yourself and you will have more time for fun when the kids are back with you. This course and this book are fantastic resources. You will have so much less stress and freedom when you control your money instead of your bills controlling you. Figuring out a budget is almost impossible to do when the kids are around, so take advantage of the time when they are gone to get it done. Having a meal plan will save you time and money. This is also a task that is much easier to do when you have some quiet time alone. You will get a tremendous feeling of accomplishment when you redo a room or even a piece of furniture. It will be much easier and less messy if you do this type of project when your littles are not underfoot. Learn to use your instapot. This will make getting meals ready so much easier. I had this instapot for months, but it sat in the cabinet until I took some time to actually try it out. Working out is great for your body and mind. Light aerobic exercise like a brisk walk reduces anxiety and depression. There are so many fun choices including aerial arts, Zumba, kickboxing, and line dancing. Yoga is a great exercise to increase flexibility. Meditation helps with concentration, focus and stress reduction. I know it is a little intimidating at first to go to a movie alone but try it. You might start with a matinee if an evening movie seems to difficult at first. This is even scarier for most than a movie. I find eating out when I am out of town easier. At least when I am out of town I am less worried that someone I know will see me and think I am a loser. (Really I know I am not the only one who thinks this). Schedule it ahead of time. Scheduling a massage for the next time you are alone for a weekend is a great way to have something to look forward to when you are alone. Much more fun to visit a museum alone and not need to wait for anyone or be rushed through the things you want to linger over. Often in the summer, there are free outdoor concerts in parks. Many communities have open mike times, so you could listen or perform. There are almost endless places to volunteer and everyone has a skill that can be used. Soup kitchens and other free community meals need cooks, helpers, and dishwashers. Habitat for Humanity needs people who can paint or pound a nail. Animal shelters need animal bathers and dog walkers. Hospital nurseries often need baby rockers. Depending on the amount of time you have you can make it a day trip, a weekend away or a week. Try camping or visiting out of town friends if money is tight. State & national parks are fantastic for this. Other options are long trails near you check at your local visitor center or call a state park near you if you are unsure of trails near you. Some places even have hiking clubs where you can meet other people to hike with. It is great fun to identify constellations. Here is a good resource for you to get started. State parks or college outdoor recreation programs often will rent one to you, if you want to try it out. You can grow flowers, vegetables or herbs. If you don’t have a yard check around to see if there is a community garden where you can grow vegetables or try growing a few things in pots. Fairy gardens are fun and the only space you need is a pot. 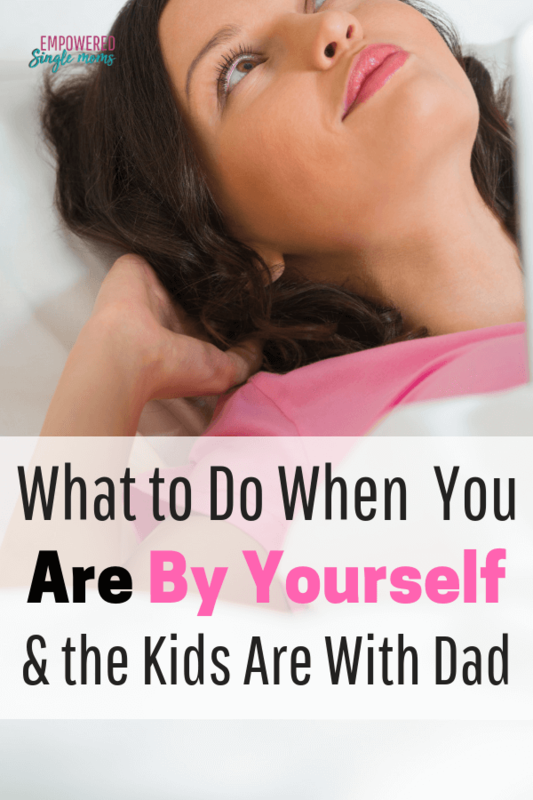 I hope this gives you some ideas of how to plan your time when your kids are away. Check out this inspiring planner to keep track of all the fun things you will be doing while your kids are with their dad. What is your favorite thing to do when you are by yourself? I made a special private Facebook group just for you where single moms can support and encourage each other as we figure out our lives as single moms. We would love to have you join us here in Empowered Single Mom Tribe.